If you like to explore your surroundings when pitched up at a site, cycling is an ideal mode of transport, but what is the best way to carry the cycles? The options range from traditional roof rack mountings to carriers mounted on the back of the car directly, or via a towing bracket and rear mounting the back panel of a motorhome. Racks mounted on the back panel of touring caravans are not suitable as they may upset the balance of a towed vehicle. Bike carriers mounted on the A-frame add a significant sum to the caravan noseweight, which could easily exceed the towcar manufacturer’s stated maximum for the vehicle – unless it’s a large 4x4. If you are using a towbar or tailgate-mounted rack on your car, the law requires your number plate and rear lights to be clearly visible. Therefore in practically every case, a cycle carrier lighting board will be required, this plugs into your 12N road light socket or your 13-pin combined socket. 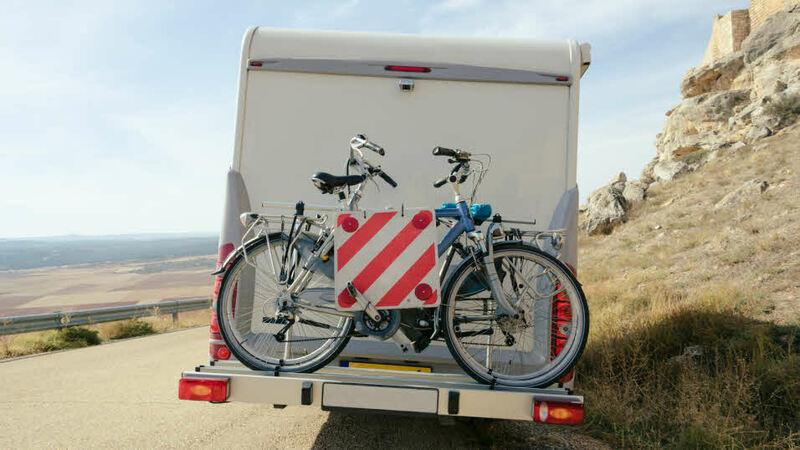 If you are a motorhome owner, there is a wide selection of racks available for carrying cycles on the back. If fixing to a coach-built body, ensure the rack securing bolts will be driven into a solid framework, and not just the sandwich panel – or make sure that a suitable load-spreading plate is used inside the body. The law requires your number plate and rear lights to be clearly visible. Therefore in practically every case, a cycle carrier lighting board will be required, this plugs into your 12N road light socket or your 13-pin combined socket. Racks fitted on the back panel of touring caravans are not recommended, as they may upset the stability of the caravan at higher speeds, and possibly cause damage to the caravan back panel. The exception to this is where the caravan manufacturer has specifically designed in the capability of fitting a cycle rack. Even in this case, it’s essential that the manufacturer’s guidance on the maximum weight to be carried on the rack is not exceeded. For most EU countries you need to ensure that your number plate, lights and indicators are not obscured and your cycle rack is in good condition, fixed securely and fit for purpose. Spain and Italy have an extra requirement to display a red and white marker board if you have an overhanging load such as a cycle/motorcycle rack. Marker boards are manufactured by Fiamma (www.fiamma.it) in plastic and aluminium, and are available from caravan dealers or accessory shops. In Spain you can use either, but in Italy the marker board must be aluminium. From a safety perspective, the use of a marker board indicating an overhanging load is a sensible option in any country. Portugal has a rule that overhanging loads must not protrude beyond the width of a vehicle, so in practical terms this means that cycles can only be carried on the back of a caravan or motorhome – they cannot be carried at the rear of a car. If you wish to carry cycles on a car, they must be carried on the roof, providing the combined height is not over 4m.